The day was gorgeous. I headed down to Indigo Beach club around noon to start promoting the Condo Hotels Super Bowl party / Football Pool and to do some socializing with the hotel guests. Indigo posted the Super Bowl specials on the board and we are raring to go. After my first round with the football pool I sat down and had a pizza and a beer with Lorena. It was truly a great day. Sun was shining. Nice breeze. As the sun went down Indigo prepared special tables inside and three televisions were setup to watch the big game. The game started and based on some of the reactions to the teams it was evident we had more Giants fans than Patriots. 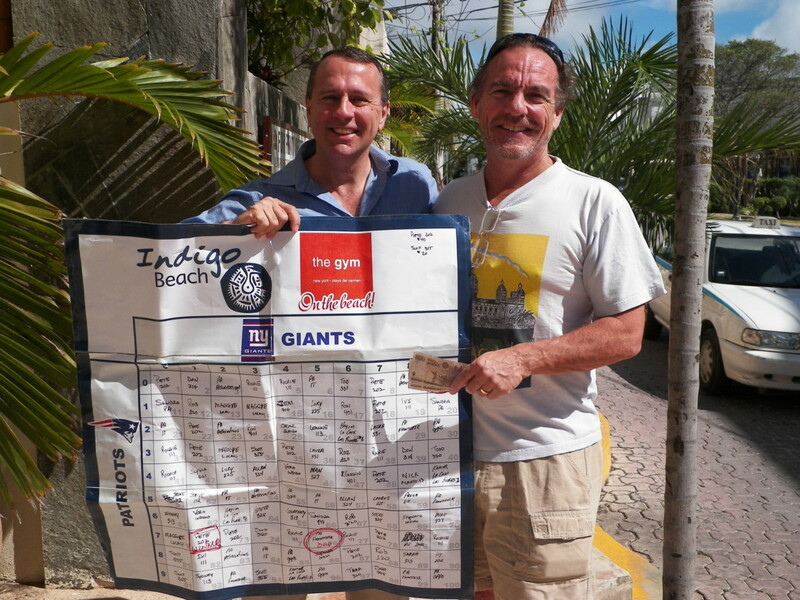 The game was fantastic and I had the great pleasure of handing Tod Hughes (the condo owner of El Taj 331) his winnings for both the first and second quarter, and Pete, who is a guest in Porto Playa condo 202, for the game ending score. What a great game! Another heartbreaker for the Patriots. Thanks for posting about the game.